Renzo Piano has designed a Cologne store for the Peek & Cloppenburg Group, owners of the biggest stores in Germany's biggest cities: a big structure with rounded lines vaguely reminiscent of a boat. Set 2.5 metres apart, the arches rise to a height of 30 metres, gradually decreasing to create an extremely light, fluid, soft form. 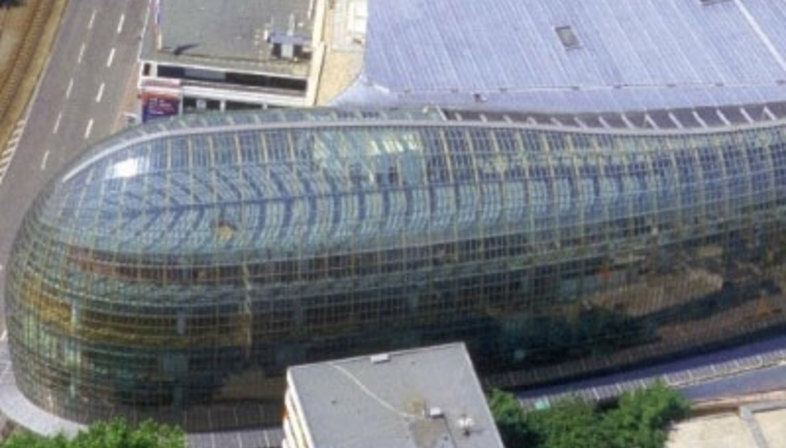 The roof consists of 3800 sheets of insulating glass. The presence of the curves suggested use of glass modules of different sizes, breaking up the façade without weighing heavily on any particular point. The result is a building/sculpture in which large size is lightened up by use of steel, wood and glass, materials which were also chosen for their low price, flexibility and rapid construction. Inside, five levels of shops jut out over a large atrium, interacting with both the inside and the outside in a non-stop play of light and reflections. The construction of the shopping centre falls under Peek & Cloppenburg's strategy of representing its image in buildings with a particularly strong visual impact.